The Brahman or Brahma is a breed of Zebu cattle (Bos indicus) that was first bred in United States from cattle breeds imported from India. Brahma cattle were produced by cross-breeding the Kankrej, Ongole, and the Gir (or Gyr) breeds of cattle. The Brahman is one of the most popular breeds of cattle intended for meat processing and is widely used in Argentina, Brazil, Paraguay, United States, Colombia and Australia among many other places. Brahma bull on display at a fair in Pachuca, Hidalgo, Mexico. The American Brahman was the first beef cattle breed developed in the United States. It was bred in the early 1900s as a cross of four different Indian cattle breeds: Gyr, Gujarat, Ongole and Krishna Valley. The original American Brahman cattle originated from a nucleus of approximately 266 bulls and 22 females of several Bos indicus (cattle of India) varieties imported into the United States between 1854 and 1926. The Brahman is mainly used for breeding and the meat industry. It has been crossbred extensively with Bos taurus taurus (European) beef breeds of cattle. It has been used to develop numerous other U.S. beef breeds including Brangus, Beefmaster, Simbrah and Santa Gertrudis. Brahman cattle are known for their extreme tolerance to heat and are widespread in tropical regions. They are resistant to insects due to their thick skin. Brahman cattle live longer than many other breeds, often producing calves at ages 15 and older. In Oman and Fujairah, Brahman bulls are used in the traditional sport of bull-butting. It involves two of these bulls engaging in a ferocious round of headbutts. The first one to collapse or concede its ground is deemed the loser. Brahman bulls being readied for this sport are kept on a special diet of milk and honey for gaining superior strength. The American Brahman Breeders Association was formed in 1924 as the official herd registry to track and verify cattle bloodlines. This organization is now headquartered in Houston. The name "Brahman" was created by the American Brahman Breeder's Association first secretary, Mr. J. W. Sartwelle. The first president of the Brahman Association was Linton Harris of Kissimmee, Florida. The Brahman Breed has made a major impact on the Australian beef cattle market, especially in the northern parts of Australia. 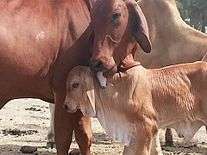 Since the introduction of the breed to Australia, over 50% of Australia's cattle population are either Brahman or Brahman cross cattle. The breed does well not only in hot temperatures but also in the colder climate. 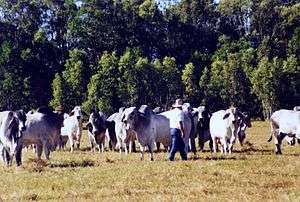 There are breeders of the Brahman breed in Victoria right through to North Queensland. It is a common misconception that the breed will not "do well" in cold climates, there are a number of breeders in areas such as Kyneton (GTM Brahmans) in Central Victoria where temperatures can be extremely cold (sub-zero) and even can experience snow falls in the surrounding districts. In Australia the Brahman Breeders Association of Australia is the body in which members register their cattle and can become members if they wish to have registered cattle. However there are a number of people which breed "commercial" cattle in which they are not registered breeders, these breeders supply cattle for the beef market commonly use stud bulls to improve the quality of their stock. ↑ Hall, Scott (February 23, 2000). "IT Telecommunications". OKSTATE.EDU. Stillwater, Oklahoma. Retrieved 2 May 2013. Heat Tolerance. Studies at the University of Missouri found that Brahman and European cattle thrive equally well at temperatures down to 8°F. They found that European cattle begin to suffer adversely as the air temperature goes above 70°F, showing an increase in body temperature and a decline in appetite and milk production as 75°F, is passed. Brahmans, on the other hand, show little effect from temperatures up to and beyond 105°F. Although heat tolerance is only one factor in environmental adaptation of cattle, it is considered the most important. These are some of the other factors that allow Brahmans to adapt to adverse conditions. ↑ "Bullfighting à la Batinah". Rough Guides. ↑ Osborne, Chrisitne. "Bullfighting: Omani Style". Travels With My Hat. ↑ Friend, John. ; Denis Bishop (1978). Cattle World. Blandford Press, Dorset. ISBN 0-7137-0856-5. Wikimedia Commons has media related to Brahman (cattle).